Why do we do SEO? Why do we send out emails? Why do we struggle to get to the first page of Google? Why do we go crazy about Social Media, Facebook-likes, Twitter-followers, LinkedIn-connections and Google Plus buddies in Circles? How often do you get one of these messages? How often are you in a position to send one of these messages? If your frequency of getting and receiving a message like this is not high enough to bring you wealth, then we can help you. It is every client’s dream to be in a position to send a message like this to his marketer. 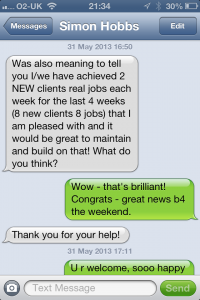 So, let’s not work too hard on the SEO, emails, Facebooks, Twitters, LinkedIn and our buddies in the Google Circles – but rather focus on the Reality: money in your pocket – or text messages like this from you client. This is every Marketers Dream!